StarUML v2.0.0-beta11 is now available for download. This release includes the following features and fixed issues. Button for Full screen mode was changed in the new version of OS X (Yosemite). Now it is adopted in this release. In Mac OS X Yosemite, the third green button act as full screen mode but with Alt/Option key it act as maximize mode. According to the UML Specification, there are many constraints that must be satisfied. It is very helpful to avoid many mistakes and making invalid models. 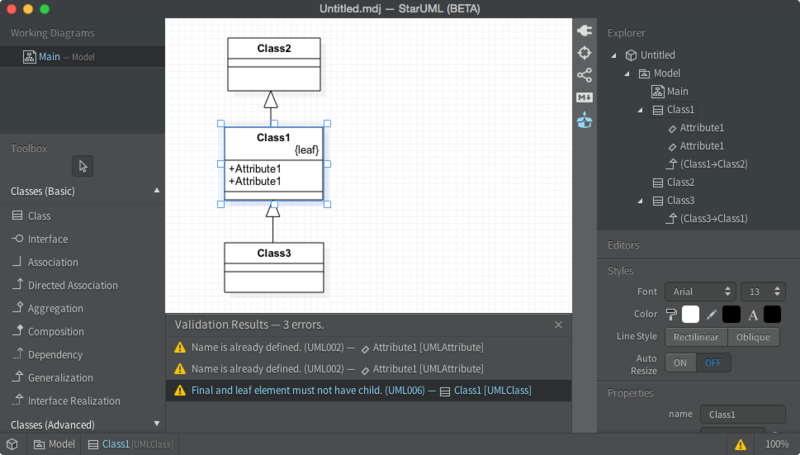 Now total 57 UML model validation rules have defined for StarUML and the rules are checked asynchronously when you save or open your model files.